The Renin-Angiotensin-Aldosterone System (RAAS) is a hormone system within the body that is essential for regulation of blood pressure and fluid balance. It is comprised of the three hormones renin, angiotensin II and aldosterone and regulated primarily by renal blood flow. This article shall discuss the system, how it is regulated and clinically relevant conditions to its dysfunction. Angiotensinogen is a precursor protein produced in the liver and cleaved by renin to form angiotensin I.
Angiotensin I is then converted to angiotensin II by angiotensin converting enzyme (ACE). ACE is found within the renal endothelium, the lungs and capillary endothelium. Once produced, angiotensin II binds to various receptors throughout the body to exert its action. There are two G-protein coupled receptors that have been identified, AT1 and AT2, although most actions occurs via the AT1 receptor. As shown in the table above angiotensin II exerts its action at various sites throughout the body. Throughout the body it acts on AT1 receptors found in the endothelium of arterioles to achieve vasoconstriction. This signalling occurs via a Gq protein to activate phospholipase C and subsequently increase intracellular calcium. This results in an increase in total peripheral resistance and therefore, blood pressure. Angiotensin II acts on the hypothalamus to stimulate the sensation of thirst, resulting in an increase in fluid consumption. This helps to raise the circulating volume and in turn, blood pressure. It also increases the secretion of ADH from the posterior pituitary gland – resulting in the production of more concentrated urine to reduce the loss of fluid from urination. This allows the circulating volume to be better maintained until more fluids can be consumed. Further information on ADH can be found here. Angiotensin II acts on the kidneys to produce a variety of effects, including afferent and efferent arteriole constriction and increased Na+ reabsorption. These effects and their mechanisms are summarised in the table below. It also acts as a sensitiser to tubuloglomerular feedback, which helps to prevent an excessive rise in glomerular filtration rate. This is also prevented by the local release of prostaglandins, which have an antagonistic effect to the renal vasoconstriction occurring. 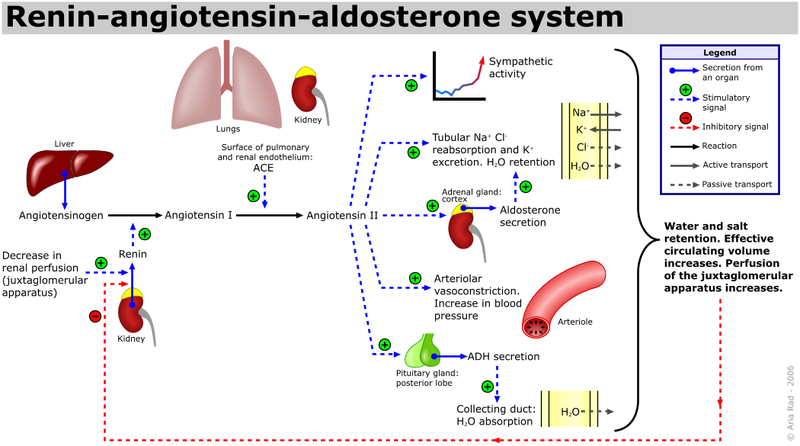 Finally, angiotensin II acts on the adrenal cortex to stimulate the release of aldosterone. This then acts on the principal cells of the collecting ducts in the nephron to stimulate Na+ and water reabsorption. It also increases the expression of apical epithelial Na+ channels (ENaC) and K+ channels. As well as this the activity of the basolateral Na+/K+/ATPase is increased to increase the extrusion of the reabsorbed Na+ from the cells. Fig 2 – Diagram outlining the RAAS and its actions on the body. ACE inhibitors are a class of drug typically used in the treatment of hypertension and heart failure. Examples include; ramipril, lisinopril and enalapril. These actions help to lower blood pressure in hypertensive patients and also help to improve outcomes in conditions such as heart failure. Typical side effects include dry cough, hyperkalaemia, headache, dizziness, fatigue, renal impairment and rarely, angioedema.